It will be all about the “Year of the Dog” at the School of Architecture on Thursday, Feb. 15, as students, faculty and staff come together beginning at 5 p.m. for a special Asian cultural event to celebrate Lunar New Year 2018 in Slocum Hall. International students at Syracuse Architecture are organizing the event in collaboration with Dean Michael Speaks. 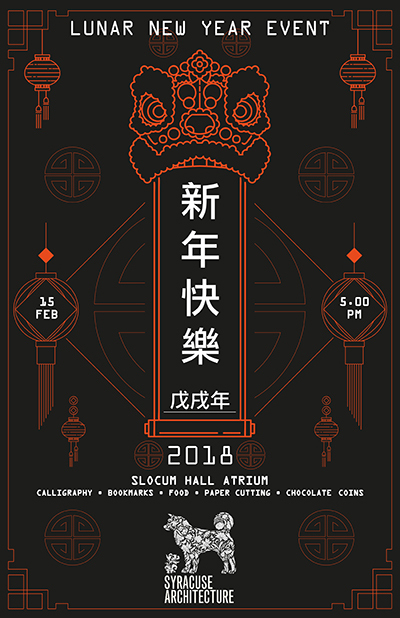 The Slocum Hall atrium will be transformed to create a festival-like atmosphere as architecture students take a break from the pressures of studio life to enjoy dumplings, tea and chocolate coins and activities such as calligraphy, a photo booth and paper cutting. Syracuse Architecture has a widely diverse population; faculty and students come from all around the globe, many from Asia. Events such as this offer international students the opportunity to share traditions of their homelands with classmates and build greater cultural understanding. The Lunar New Year party in particular brings a piece of home to Syracuse University for Asian students who typically miss out on family celebrations back home since the holiday takes place in mid-February.